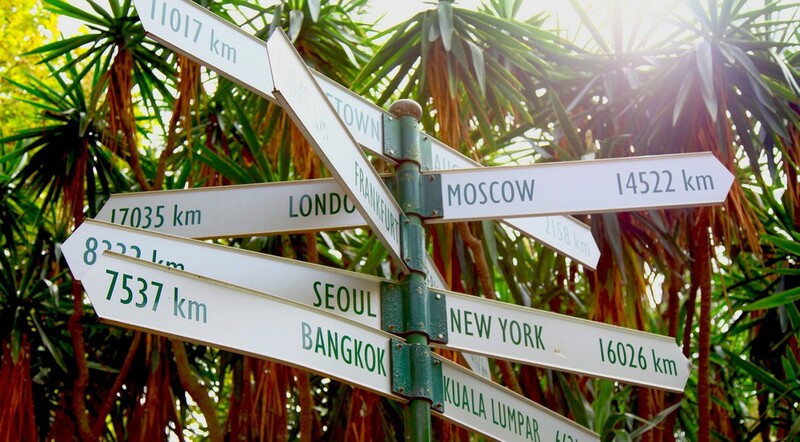 We continue the series of articles devoted to travel to Australia.The spirits of freedom, kangaroos, koalas, the Grand Prix of Formula 1, right-hand drive cars, Sydney Opera House…And from what do you associate green continent? Perhaps, when it comes about Australia, the first thing that comes to mind is a kangaroo and Sydney Opera House. Will talk about this! Sydney — the capital of New South Wales and the place of the first colonial European settlement on the continent.The city was built on the shore of a beautiful bay, and eventually occupied the entire territory of the Port Jackson Bay.Sydney is famous for Opera House, Harbor Bridge and the beaches…Yes, exactly beaches, you read it right! 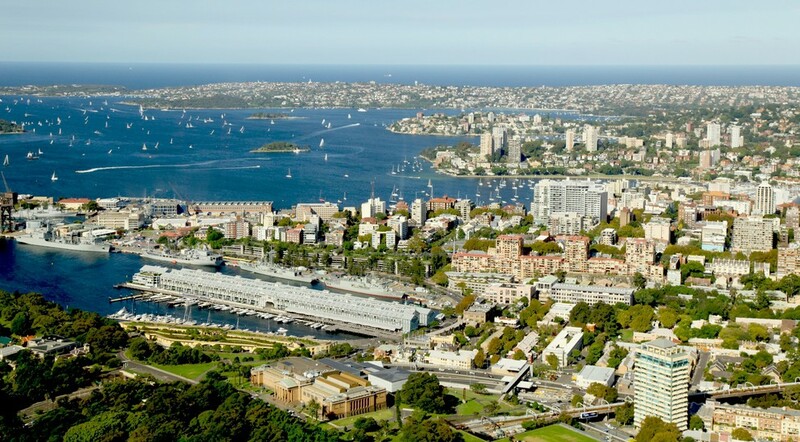 At the same time Sydney — a modern metropolis, in which is nice to be surrounded by water and greenery. Sydney Opera House — one of the most famous buildings, not only in Australia but all over the world.And first of all we wentright there. Just walk away from the hotel! I really wanted to feel the city, and on my tongue whirled “pinch me”. We did not bother even the fact that it was late evening. Late Friday night!So, there are a lot of beautiful sports cars came out to the roads!So we went and literally rolled up our heads. In generallywe met cult "Japanese", popular in our country, in Russia. Which is not surprising, because the movement in Australia — left hand and machine — RHD.But the fact, that you went to the ends of the earth, and immediately saw not the gray mass of ordinary cars, but a colorful collection of sports car, impressed.On the same night, we accidentally found a meeting place for fans of tuning and racing.Or maybe it's just been fans of the movie "Fast and the Furious. "Anyway, beaming washed up and polished sides, under the light of lanterns show off Nissan Silvia S15, Mazda MX-5, Toyota Celica and MR-2, Porsche 911 and, of course, all-wheel drive specimens — Subaru Impreza, Mitsubishi Evolution. Romance! In the morning absolutely other cars crept out to the streets — family and work.It should be said that most of them was jeeps and pickups!In contrast to our country, where SUVs are popular because of the comprehensive off-road, in Australia they are just cheaper, and therefore more available for purchase.Tax on import of the SUV twice less than in a car, so there are completely different people go on them:and serious men, students and managers, and mothers with small children and housewives — in short, everybody. By the way, a few days we learned to cross the road and look first to the right and then left,and not the opposite as in Russia. In the training helps us a lot inscription on the pavement, which read, "Look to the right" or "look left" posted, apparently just for tourists. Everyone who comes to Australia, cannot fail to notice here cars with label which illustrate the lion.They can also be seen in New Zealand, South Africa and some other parts of the globe. Name these cars — Holden, it is given in honor of James Alexander Holden, Who emigrated from the UK in 1852 and in 1856 founded the firm JA Holden and Co in the southern Australian city of Adelaide. Then Holden was established his own workshop, where he began by first treating the leather,then the production of carriages and crews and later release of bodies for cars.In 1926 the company became part of General Motors, and in 1931 began producing cars under the brand Holden.The company produces not only passenger cars (externally some of them — an exact copy of the Chevrolet, but only the right wheel and other icon), but commercial trucks, SUV and pickup trucks. Most models — licensed version of Isuzu, Opel and Chevrolet. There are among Holden and often unique cars that are produced only in Australia, "Ute" with motors V6 and V8!In common parlance "Ute" called pick-up in the style of «coupe utility». Unlike classic pickups front part of the "Ute" is styled as two-door coupe.The ancestor of this type is considered the Australian division of Ford. Holden Ute eloquent slogan says: «Ready for everything». Unfortunately, at the moment General Motors cars under the brand Holden, is not sold outside Australia and New Zealand.It should be noted that there is a separate division Holden HSV (Holden Special Vehichles), which is engaged in the production of sports cars.The body of these cars taken from the normal urban models, but all the technical part is completely modified. What is interesting in the city itself?Among tourist popular excursion: climb to the biggest bridge of Sydney Harbor Bridge — one of the most impressive steel arch bridges in the world.But we decided just to admire it from the outside and climbed the Sydney Tower, where from the observation deck offers a magnificent 360-degree panorama. We drove through the circular monorail, stops of which is located just in the homes at the height of the second floor, looked at the aquarium for sharks and even the inhabitants of the Great Barrier Reef and walked on Darling Harbor. But best of all, you can feel the city near the water and from the water. 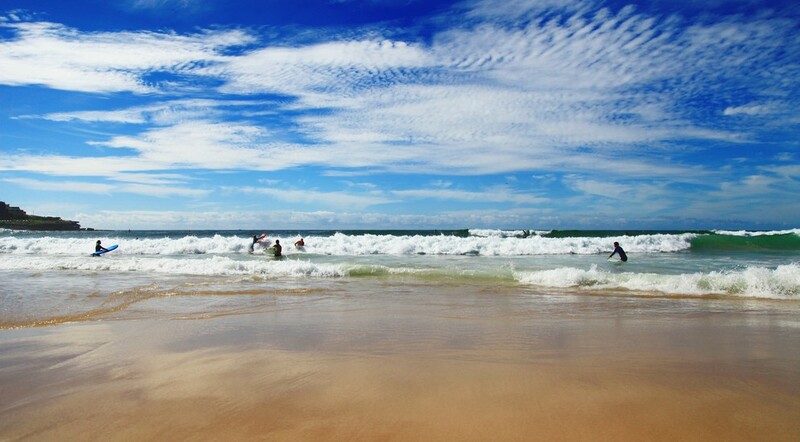 And to understand why Sydney is famous for its beaches, it is enough to come "at least" on Bondi (in the language of Aborigines — "the wave crashing on the rocks").It looks like a surfboard there is in everyone — and the man and women, old and young alike — all catch a wave!How to transport the board? Of course, on the vehicles.Some craftsmen contrive to place them, for example, on the roof of their old Civic…By the way, so popular in Russia ugg boots — in fact shoes for surfers! Explore the surrounding area of Sydney we went already by car.We had to overcome about an hour wayto the Blue Mountains, which are part of the famous Great Dividing Range. And do not forget: in Australia driver and passengers’mandatorymust wear seat belts, even in the back seats.Roads outside the city are magically empty. Within a few kilometers around Sydney there is still some activity, but then — silence and absence of people. 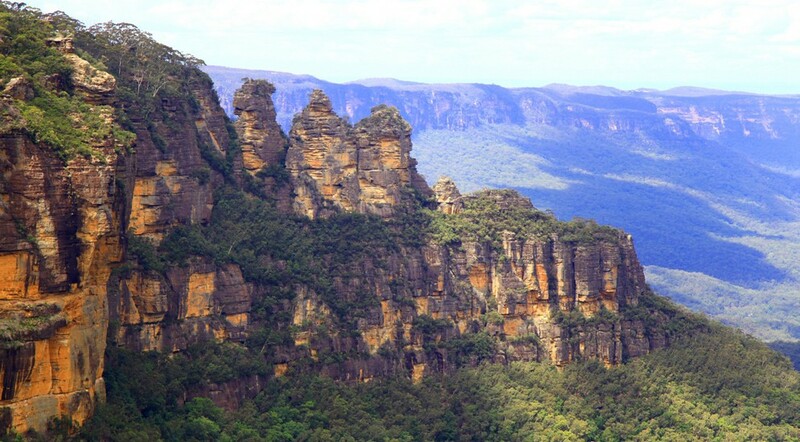 Blue Mountains National Park got its name because of its unusual optical phenomenon of huge eucalyptus trees stand out numerous oil droplets refracting the sun's rays that give the haze, enveloping the mountain range, blue shade.Is similar to some fantastic mirage! And the air — just extraordinary! But what about the kangaroo? And they are here too! We could go to the zoo, but we decided that since we are in a car — go to one of the parks of wild nature (wildlife park), there are countless multitude of them in the country. And from that and began our acquaintance with unusual animals of the continent.Here you can feed the kangaroos and pet the koala, and dingo, emu, platypus, wombat and even Tasmanian devil — well consider closely. And furtherwe have continued the unity with nature, at Phillip Island. On this trip, read our next article.